Floods triggered by exceptionally heavy monsoon rains in the northwestern province of Khyber-Pakhtunkhwa (KP) have killed at least 800 people and affected up to a million across the country. Officials fear the worst is to come if floods hit the more populated provinces of Sindh and Punjab over the coming days. “Dozens of homes here have been very badly damaged by water racing down from the hills and pouring into homes. People have been clinging to rooftops to try and stay safe,” Inayat Jan, a local resident from a village in the Shangla district of KP, told IRIN over the phone. 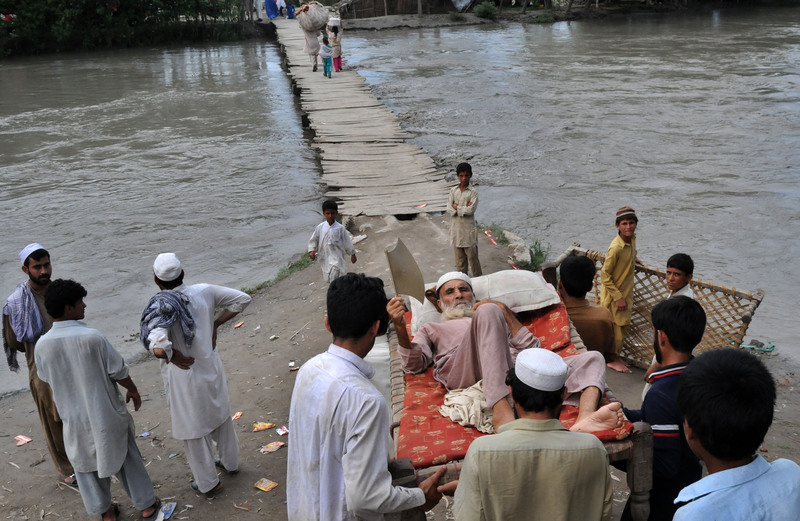 In KP, Swat, Dera Ismail Khan and Charsadda districts are the worst affected by floods. The UN Office for the Coordination of Humanitarian Affairs (OCHA) said in a 29 July report that 25 districts in KP had been hit by flooding, affecting at least 400,000 people. It said these were the worst floods in KP since 1929. “Reports indicate that in Charsadda, more than 5,000 homes are underwater and 20 villages have been affected. The road links to Peshawar have also been cut off. In Swat, the Swat River has broken its banks. It is reported, four subdivisions have been affected, with two villages flooded and more than 1,000 homes underwater,” said the OCHA report. The government declared a state of emergency after the meteorological department said an “unprecedented” 312mm of rain had fallen in 36 hours in northwestern areas. It predicted “scattered showers” over the next few days in KP, but warned of further rain in the eastern province of Punjab and in the southern province of Sindh. OCHA said that while KP was the worst-hit, more than a million people around the country had been affected by flooding. According to media reports, at least 60 people were killed in floods in the southwestern province of Balochistan and humanitarian agencies say 150,000 people are affected there. Flooding has disrupted life in Upper Punjab, Gilgit-Baltistan on the Afghan border and Pakistan-administered Kashmir, where the BBC reported 22 deaths. Some media reports put the countrywide death toll at around 1,300. Relief efforts have been hampered by poor conditions and the fact that roads and bridges have been cut off by flooding. “There is much havoc as around 50 bridges have been swept away,” said Bilour. National Disaster Management Authority (NDMA) Chairman General Nadeem Ahmed, speaking to the media in Islamabad, said that 17 helicopters were participating in relief efforts and that 900 people stranded in various locations had been airlifted to safe places. With limited access to cut-off communities, aid workers are concerned that water-borne diseases could spread quickly. “We must prevent disease. There are already reports of stomach problems among children,” Dr Mahmood Khan, a physician working with KP government teams in Peshawar and Nowshera, said. Local resident Nazeer Ahmed, 40, from Mingora in Swat, said the flooding came at a time when people in the area had just begun rebuilding their lives after months of having been displaced by conflict between the army and militants. In Peshawar, about 70 families have taken refuge at a government school after water inundated their homes. “We were unable to remove our belongings or even documents; we just fled as fast as we could,” Sameera Bibi told IRIN. Makeshift camps for displaced people have been set up in Swat and in the Peshawar and Nowshera areas.